Since my last post about the Art de la Guerre (ADLG) rules in mid-December last year I've been playing reasonably regularly and trying to force the rules into my head. It is getting better, or rather I am getting better. Recently I tried a completely different army (Timurids) including elephants and levy units. I also attempted some quite ambitious moves but it's fair to say they didn't all come off. Following my first outing in the Northern League I've been aware that flank attacks fall into two distinct types: those where the unit is attacked whilst in combat to its front and those where it's not. The two types are very different and the former is far more effective and can be crucial to winning a game quickly. In my last game I repeatedly confused the two and when I got home I decided to do something about it. 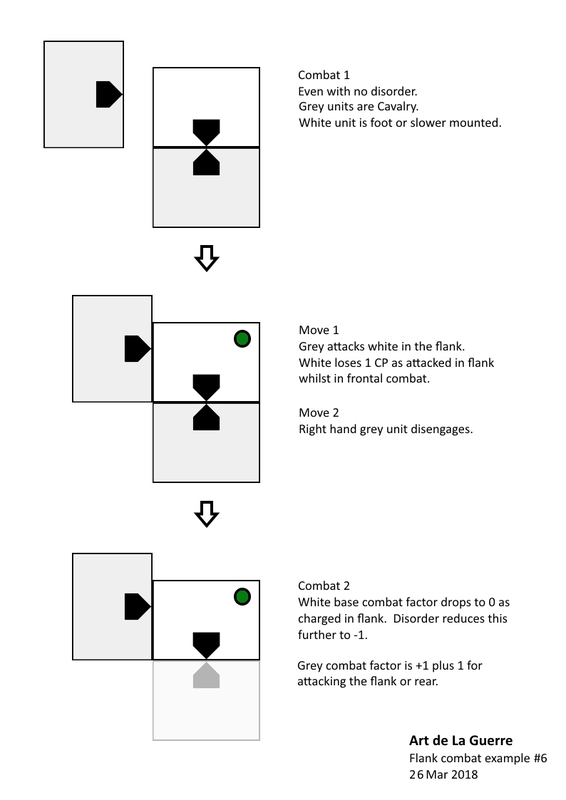 When I was writing the DBMM for the Befuddled series I found that simple diagrams were very powerful and I decided to produce a few for ADLG flank attacks. Some of what follows may be obvious to more experienced players but my intention is to help the novice (that's me!). All the diagrams above can be downloaded as a pdf from my ADLG resources page. 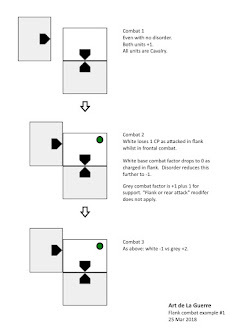 This pair show when to apply the melee modifier for attacking a flank or rear. It only applies when the flank attack is the first, or main, attack. 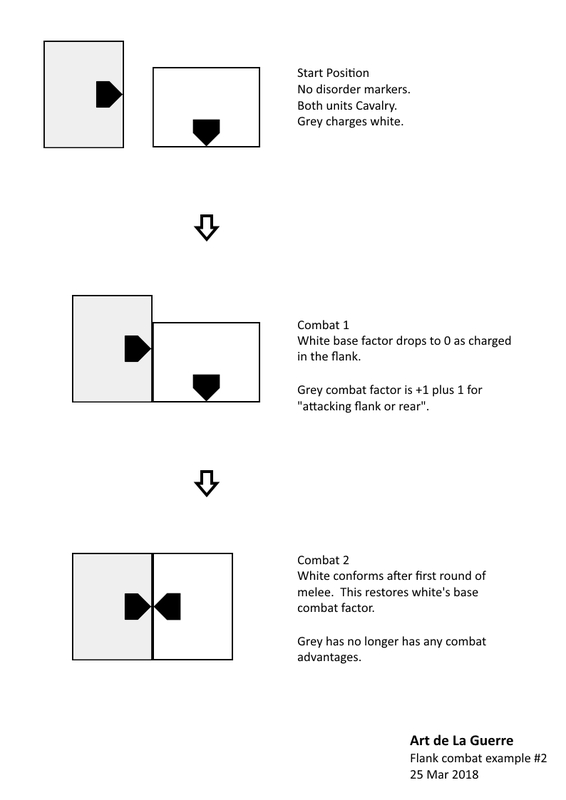 It also highlights that the loss of 1 CP only occurs if the defender is already in frontal combat. Finally it shows whether the benefits of flank attacks persist beyond the first turn. 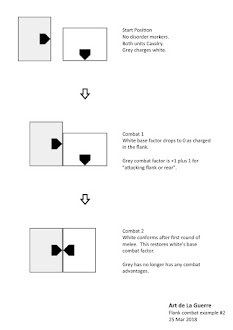 The key point here is that the move does not result in a loss of 1 CP. 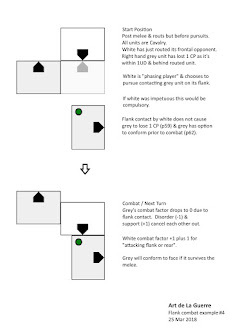 This move may look suicidal but if grey moves next the results will be even worse so its a case of making a bad move to avoid an even worse outcome. The first one (example #4) is somewhat artificial to illustrate part of the pursuit rules. 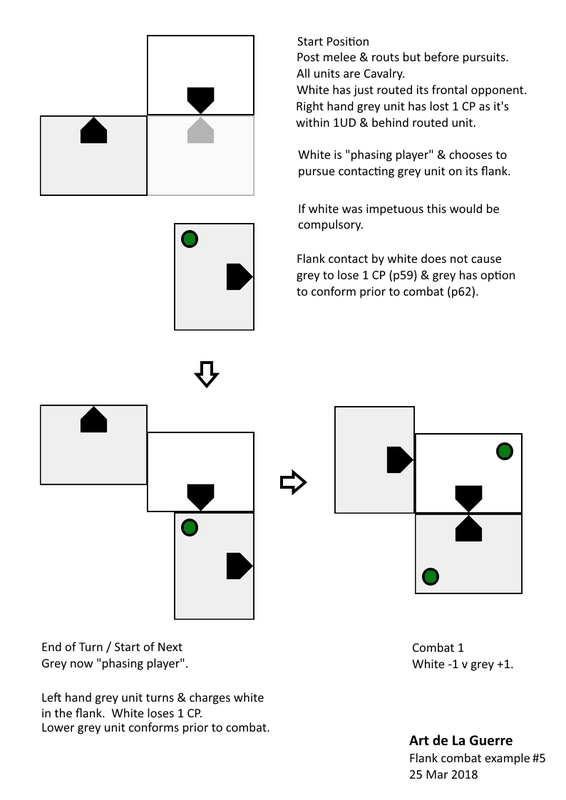 The second is a much more reasonable option but only if grey has sufficient command pips to make the flank attack. 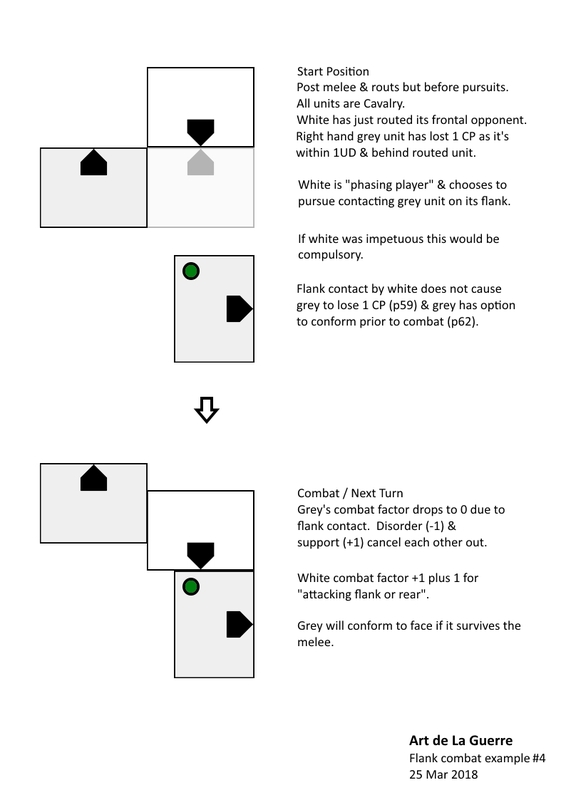 There is a third option where grey doesn't have enough command pips and the unit attacked in the flank conforms but I've not drawn that diagram and will leave it to you to work out the combat factors. 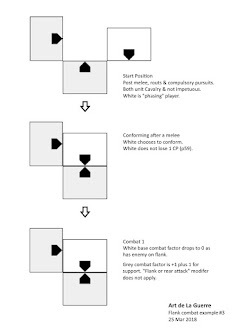 The first one is the "standard" move (example #1 repeated from above) and the second is a tactical variant. As drawn the diagrams show that the combat factors are the same (with similar attacking units). This and the need to use more command points in example #6 may lead you to think this tactic is not for "everyday" use. However there are benefits when the flank attack is by a stronger unit (Kn, armour, elite, etc), the disengaging unit is weaker (disordered, mediocre etc) or both. 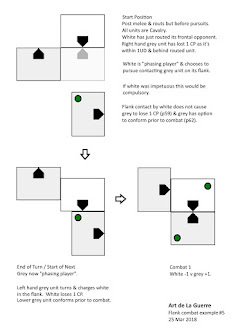 Should grey succeed in routing its enemy, the white unit would have to turn and face the grey unit before routing to the right through its friends. 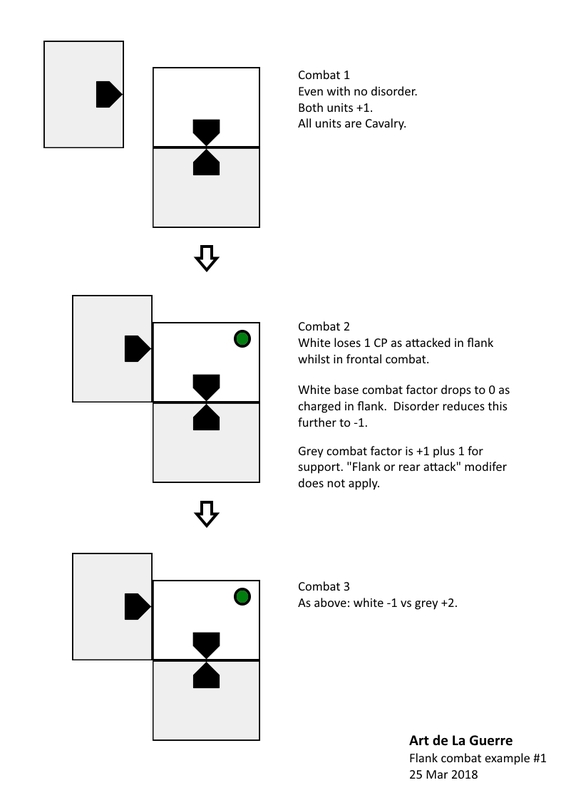 This would cause the next white unit in line to lose 1 CP. 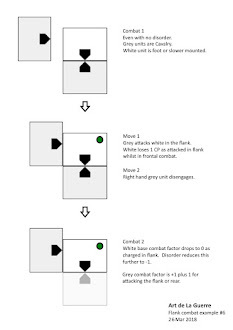 The grey flanking unit then has the option (if not impetuous) to pursue (forcing a combat next turn) or to stand with a potential second flank attack in its next turn. The former keeps the pressure on. The latter gambles that white (who will move next) will not respond and counter the threat of a second flank attack. I suppose this is for the more experienced players. I can't see me using it just yet. That's it for now except for me to thank Kevin Johnson & Mick Hood for their efforts in checking the diagrams and their helpful suggestions. Of course, all errors remain mine.